Women always like decorating and rearranging things in their homes – at least most of the women we know are like that. We tend to make sure everything around us is beautiful and always worth the stare. 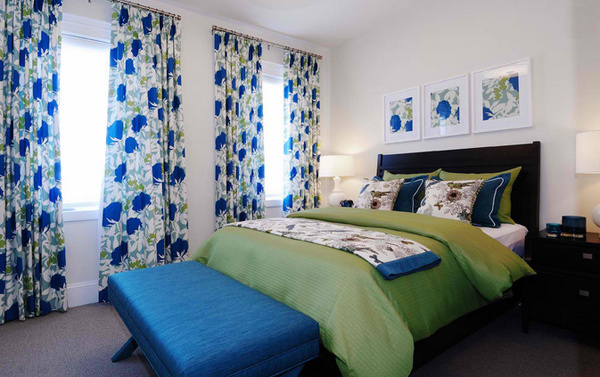 Shopping for your curtains may it be for the living room, the dining room or the bedroom – we love it! 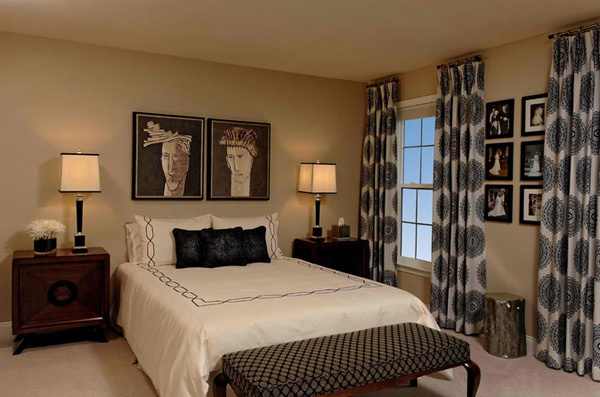 Because aside from its shopping – curtains or drapes are the clothes for the spaces at home! Today, we will be showing you 15 Superbly Stunning Bedroom Curtains that will entice and encourage you more in going out and picking out the best curtains for you – you can get it in neutrals, in single and bold colors or in stripes – just like the clothes we buy for ourselves! With not much noise, check out the photos below! If you are fortunate enough to have a wall of floor-to-ceiling windows with stunning curtains like these in your bedroom, and with a killer view to boot, you almost don’t need to gild the lily with lots of color. Abbreviated rods work well in a small room where full-length models might look overbearing. Here, hanging them right at the ceiling keeps them from getting lost in a field of wall space and visually heightens the room. 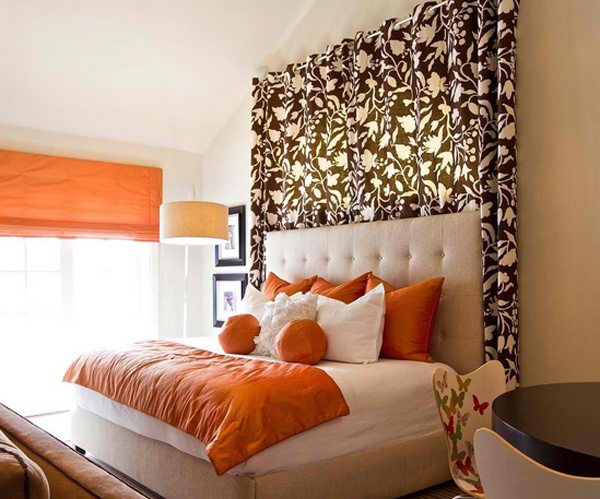 Another harmonious combo: tans with accents of spicy orange and greens. Don’t skimp on the drapes. 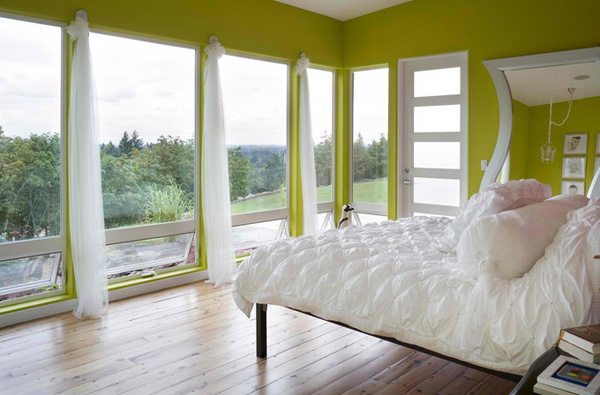 Add volume to your windows with extra widths of fabric. 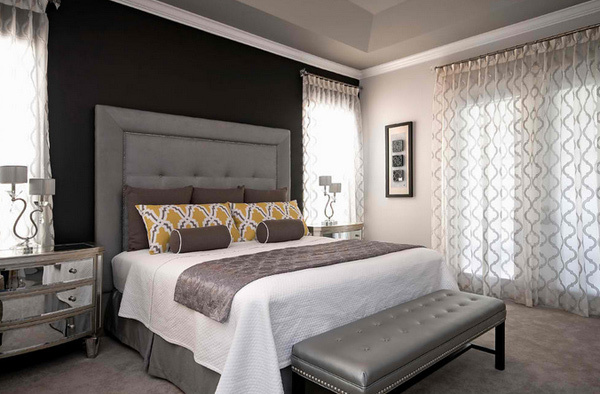 The room is gorgeous – we love the metallic, yellow and grey scale palette used in space. 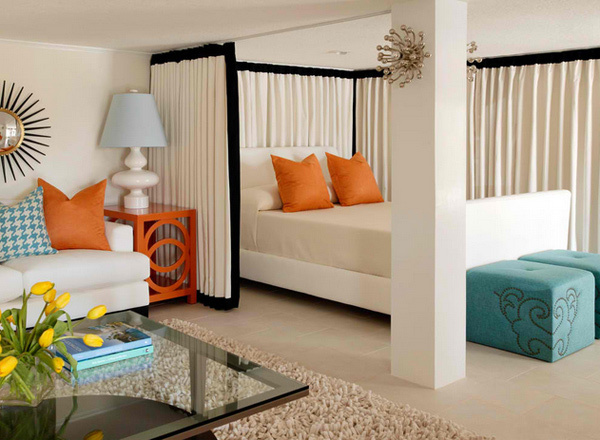 We really like the end tables and the framed photos around the bed which accentuates the entire room. The white curtains sure make the colors of the wall pop. Studio apartments also benefit from this floor plan. A bed in the corner will create a distinct sleeping space separate from everyday living, especially when it’s enclosed by a privacy curtain. The design intent was to create a cheerful yet equally calming sanctuary that also reflects the design style of the Architect: clean, contemporary, warm and inviting. At first sight, you would have never guessed this bedroom was in the same house. The designers added an element of surprise here given the fact it was separated from other parts of the house. 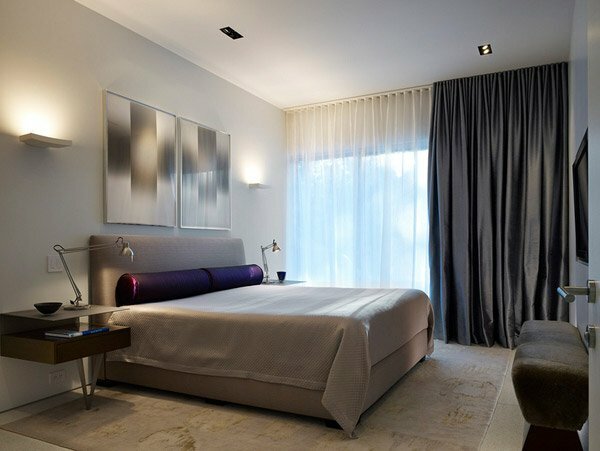 For greater flexibility consider pairing a translucent curtain with a separate blackout curtain, mounted back to back. That way you can get either filtered light or total darkness, depending on your needs. 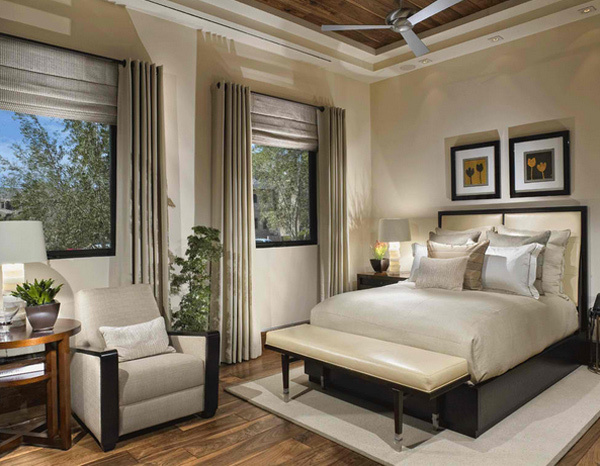 The blackout curtain here extends from floor to ceiling and wall to wall, assuring complete darkness while minimizing the presence of the sliding glass doors. Hanging a sheer curtain behind headboard with twinkle lights maybe the best one yet, but the design and set up for this bedroom is beyond gorgeous. We love it! 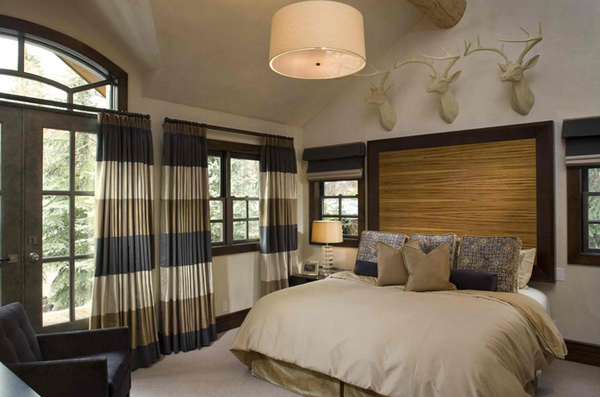 This is a guest master bedroom with a modern loft feel with a touch of humor acknowledging its mountain location. 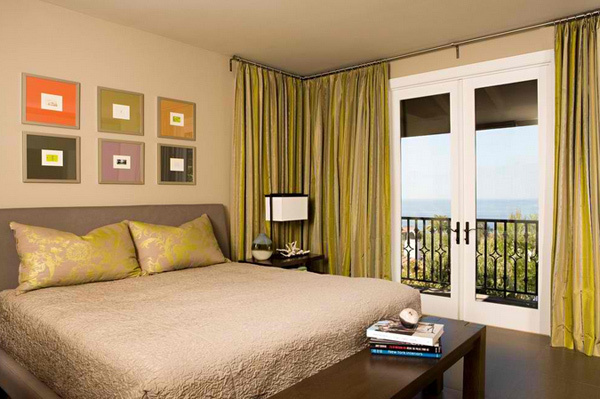 Note how pretty the curtains are – the color combination complements well with the bedroom aura. 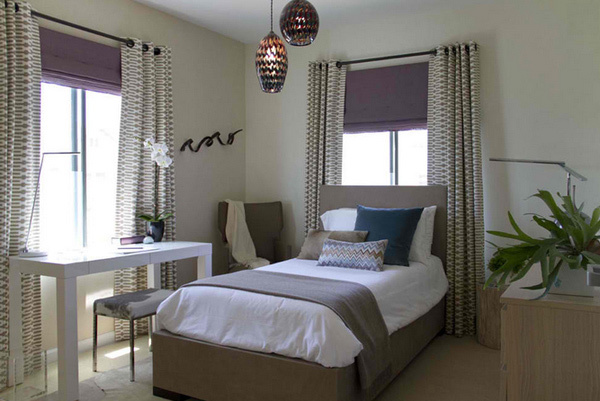 We like the window treatments that offer both the full light blocking blinds and the pretty side drape panels. The panels and blinds can be different. The panels can be a pretty print. Merging traditional and contemporary design effortlessly can be a daunting architectural challenge; this Presidio Heights residence became a highly successful melding of the two aesthetics. 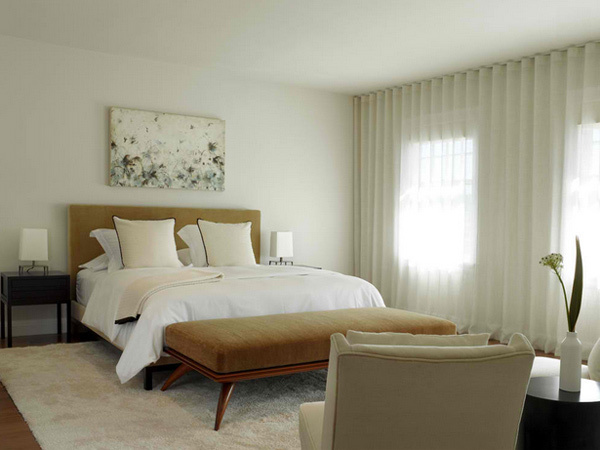 We can always say that using white curtains and drapes are the best, especially that it suits everything else – maintaining its cleanliness is kind of a chore. Using printed or darker shades allow you more time in changing them since the stains or the dust does not look you directly in the face and tell you it’s time for another shopping! For more curtain inspiration, check out the 15 Gorgeous Dining Room Curtains and tell us what you think!